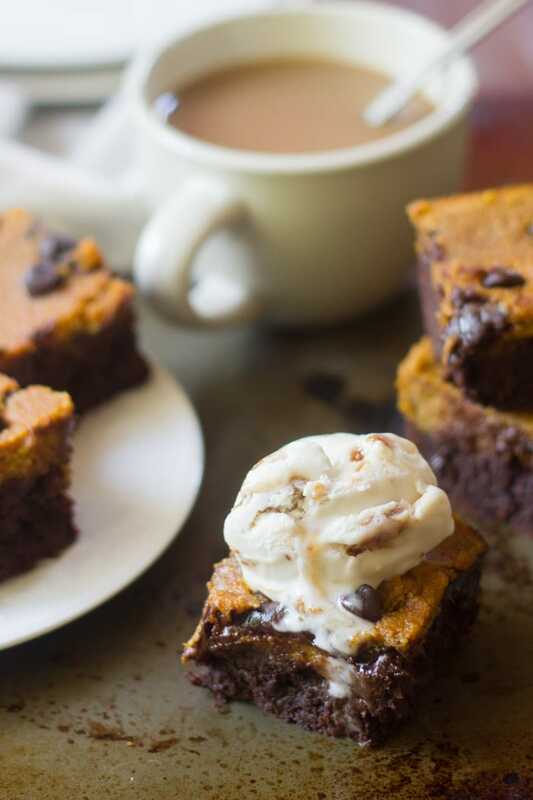 Fudgy chocolate chip-studded vegan brownies are topped with a layer of luscious cashew cheesecake to make this decadent and totally vegan fall dessert. I can’t believe it’s the end of September already and I’m just getting to posting my first pumpkin recipe of the season. But then I can, because it’s been freakishly hot where I live and for the most part, pumpkin anything feels wrong when it’s a thousand degrees out. On the other hand, I am excited about pumpkin and all things fall that are forthcoming (in case I haven’t mentioned that enough on this site), and tomorrow it’s supposed to start feeling like fall, so in a way, I got a head start by posting this today. I have Sam from over at It Doesn’t Taste Like Chicken to thank, at least in part for that. 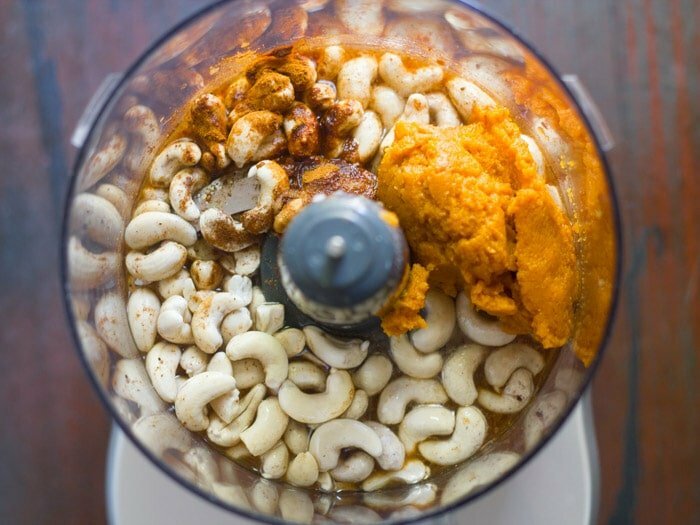 Sam and I decided to challenge each other to create a recipe using three ingredients: pumpkin, cashews and ginger. We decided on all of this weeks ago when I would’ve expected it to feel like fall by now. It doesn’t, but like I said, it got me ahead of the game! If you haven’t checked out Sam’s blog (and, actually, I know for a fact that a bunch of you have and are big fans), please go on over and do so! I know you guys will love her and her vegan creations. Like me, she’s focused on creating food that’s absolutely delicious and will make anyone love eating vegan. If you like my recipes I can guarantee that you’ll enjoy hers too! Head on over and definitely check out the Melty Stretchy Gooey Vegan Mozzarella Cheese (<– OMG, yes!) Ultimate Vegan Chocolate Cake, and 6 Ingredient Pulled Jackfruit. Oh yeah, I’m pretty psyched that Sam’s got a cookbook coming out next month! 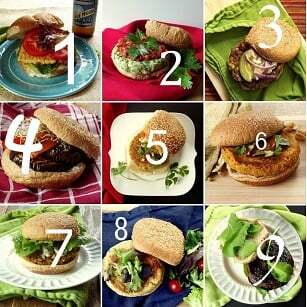 It’s called Fuss-Free Vegan and it’s all about easy vegan comfort food dishes, which we all love around here. You can read a bit more about it and even order a copy here! I found out earlier this week that Sam’s recipe for our challenge is Pumpkin Cashew Curry, and now I’m totally dreaming about curling up with a bowl of it in front of a cozy fire. I love savory, spicy pumpkin dishes so I’m really excited to try this. I’m also really glad she went with something savory, because paired up with these brownies you’ve got dinner and dessert covered! 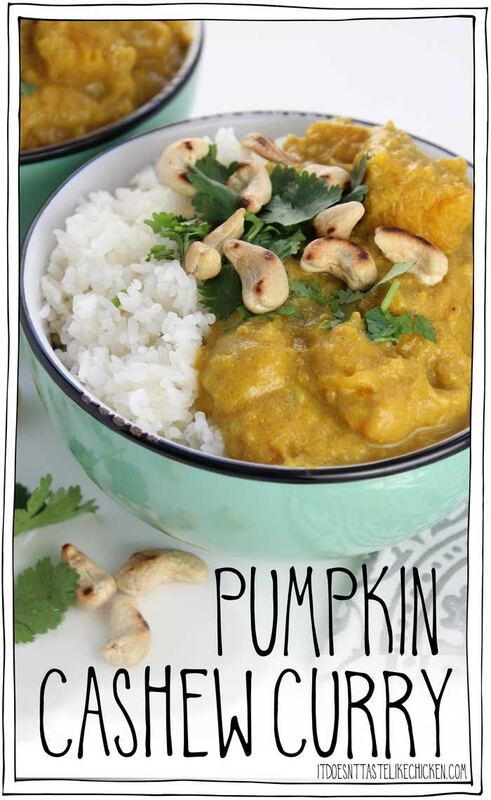 Here’s the pumpkin cashew curry! Looks amazing, right? And as for these brownies, well I got the from a tip a friend gave me a few years ago: buy a box of brownie mix, add a can of pumpkin (nothing else), and bake as directed for easy vegan brownies. 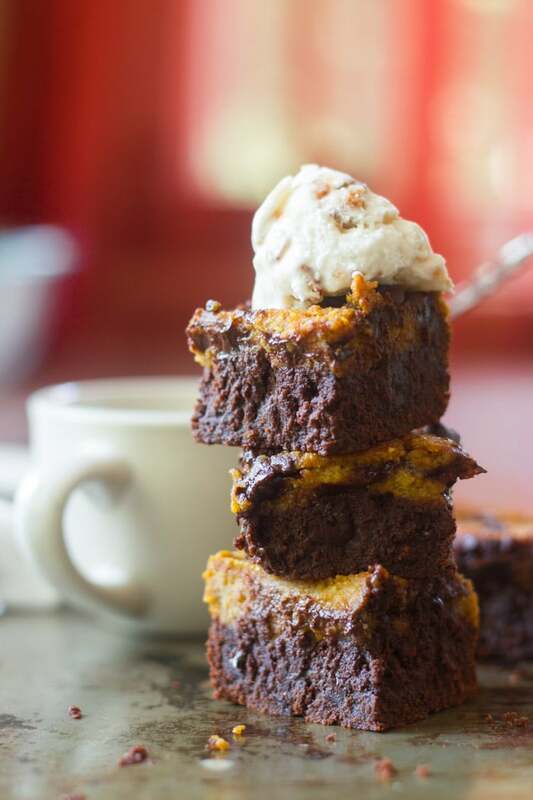 My pumpkin cheesecake brownies aren’t quite that simple, but they’re worth the effort. 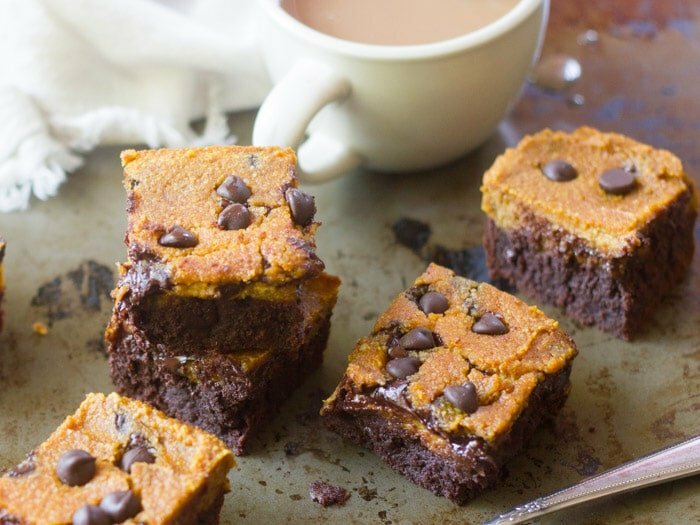 Pumpkin in the brownie base, pumpkin in the cheesecake, and chocolate chips throughout. It’s all the best things about pumpkin pie and brownies and cheesecake in vegan form, and it’s delicious. Oh, and a scoop of vegan ice cream on top, if you really want the ultimate vegan dessert. I had a hard time keeping my hands off of them! Preheat the oven to 350° and lightly oil a 9 x 9 inch baking pan. To make the brownie layer, stir the coconut oil, pumpkin puree, vanilla and sugar together in a large mixing bowl. Add the flour, cocoa powder, cinnamon and salt. Stir just until fully blended. Fold in the chocolate chips. Spread the mixture into the bottom of the prepared baking pan and bake just until set in the center, 18-20 minutes. While the brownie layer bakes, place all ingredients for the cheesecake layer except for the chocolate chips into the bowl of a food processor fitted with an S-blade. Blend until smooth, stopping to scrape down the sides of the bowl as needed. Remove the blade or transfer the mixture to a bowl and stir in the chocolate chips. When the brownie layer is set, remove the pan from the oven and spread the cheesecake mixture over top. Return the pan to the oven and bake until the cheesecake layer is set, 22-24 minutes. Remove the pan from the oven and allow it to cool completely. Cut into 16 squares and serve. I can’t wait to try your pumpkin cheesecake brownies! I’ve been drooling all over the photo ever since you sent it to me. I need them NOW! Why oh why is it still boiling hot in my un-airconditioned house? OMG it’s sweltering in my house too! I’m really looking forward to having a nice fall dinner of your pumpkin cashew curry and one of my brownies for dessert when it cools off! And thank you so much – this was so much fun and I know my readers will LOVE your blog!! PS Looks like you and Sam are a collaboration made in heaven! Hi Catherine! I think it should work if you roast and puree the pumpkin. Here’s a really good tutorial on how to do that: https://themuffinmyth.com/how-to-process-a-pumpkin/ You’ll need about 1 3/4 cups. Enjoy the brownies!